Dave Fox's Outbursts! : CNN Breaking News: Ho(e)s in the White House Aren't "Nappy-Headed"
CNN Breaking News: Ho(e)s in the White House Aren't "Nappy-Headed"
English grammar was challenged this week when journalists scrambled to determine the correct spelling for the plural of the word, "ho." It's not the usual challenge newspaper editors face, but talk show host Don Imus's controversial comments this week have brought this dilemma to the forefront of American linguistic debate. 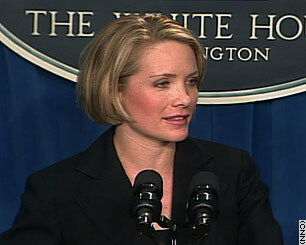 I've seen it spelled "hos," "hoes," and "ho's" by various media outlets. Imus, we all know, got into trouble after referring to the Rutgers women's basketball team on his radio show as a bunch of "nappy-headed ho(e)(')s."
But it seems Imus is not the only person in the media using this controversial word. 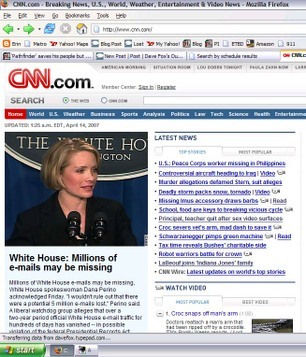 Personal note to the editors over at cnn.com: You guys really need to be careful how you crop your photos of Dana Perino, the new White House spokeswoman. Ok, it took me a minute to understand about the photo, but I get it now. It took me a few minutes, but when I finally saw the light I laughed out loud. You have a good eye. You see, I am actually a certified Santa from the "Norwegian Santa Claus Academy". Funniest school I ever went to, worst job I've ever had. My problem is about the semantics; does that mean I know how to do hoes?